Hey guys, sorry I haven’t posted in a couple of days. A family friend came into town for a funeral (not someone I knew, fortunately), and the last day has been spent catching up. But while I’m taking the time to apologize for my absence, I also want to take the time to ask some of you for your opinions. I’m in the process of doing a major overhaul of my blog and really working on making everything look more professional. I want to do a whole new layout and a new style of featuring my polishes and makeup. I’m trying out a new way of taking pictures and I downloaded some photo editing software. I’m also working on finally watermarking my pictures, which is long overdue! I am hoping that you guys will give me some feedback on the type of layout you prefer and your opinions on my posts. Are they too wordy? Do you prefer more pictures of manicures or you do like that I just do the 2? Let me know your thoughts and any tips on how to improve would be really helpful! Now onto the polish! Zoya “Ibiza” is one of those cult classics that I can’t believe I didn’t own before. 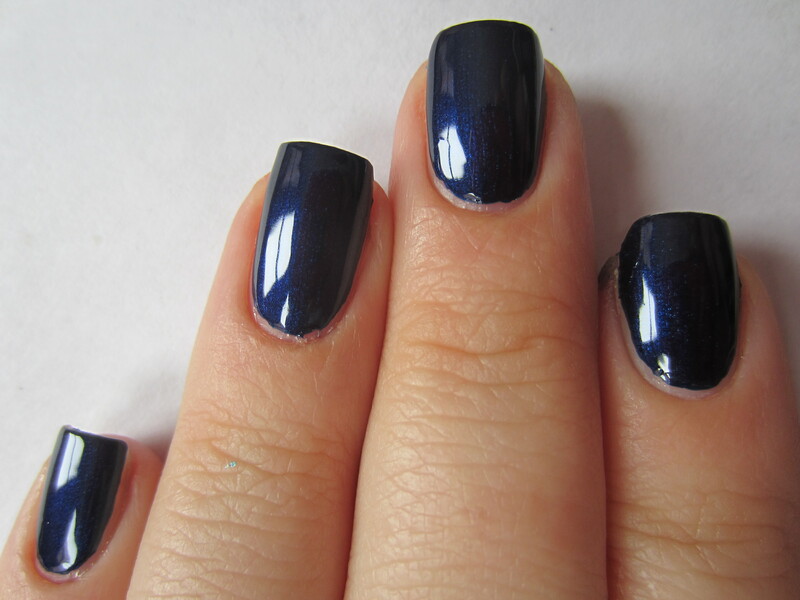 Its a classic navy metallic polish that I think almost everyone has. I picked this up during the January promotion after some not to subtle pushing from several other nail junkies who said I “needed” this polish. Well, I did need it because this may be my favorite navy now! The formula is fantastic on this polish! It is almost a 1 coater. I did two coats for the picture but I was really impressed with how pigmented this was. And I was also impressed that it didn’t stain my nails! Many super pigmented blues will stain my nails but this one was perfect. It had a normal try time and a normal consistency. Overall, it was a great polish and definitely a staple polish for every collection. What do you guys think? What are your favorite navy polishes? As for your blog, I like the “wordiness”. I actually prefer having more words! And for pictures, I also like how you don’t overload them. Especially since they’d be of the same manicure! awww thanks! i look at other blogs all the time and sometimes think about changing up how i do things. but thanks for commenting and telling me you like my set up! Hi. I do not think your posts are too wordy. I like your full descriptions with pros and cons. I am happy with your pictures as well. thanks valentina! thats really nice! oh wow all of those are amazing polishes! i passed on roadhouse blues and totally regret it now. and i used to have big smoke and it was incredible!! Another thing to put on my Zoya wish list! I like words – so many people think videos make up for the words. I like your videos a lot but I like having text, too. aww thanks! some people have told me that i include too much of my personal life in my posts so i was looking to see if everyone felt that way. but if people like it, i’ll just keep going how i have. thanks for commenting and letting me know! thanks for your suggestions! i’m in the process of making a new banner because i HATE mine! i made it on one of those free banner sites over a year ago when my blog had like 2 readers. now its embarrassing that its still up but i haven’t had the time to really play around on my photo editor to create a new one. thanks for commenting! 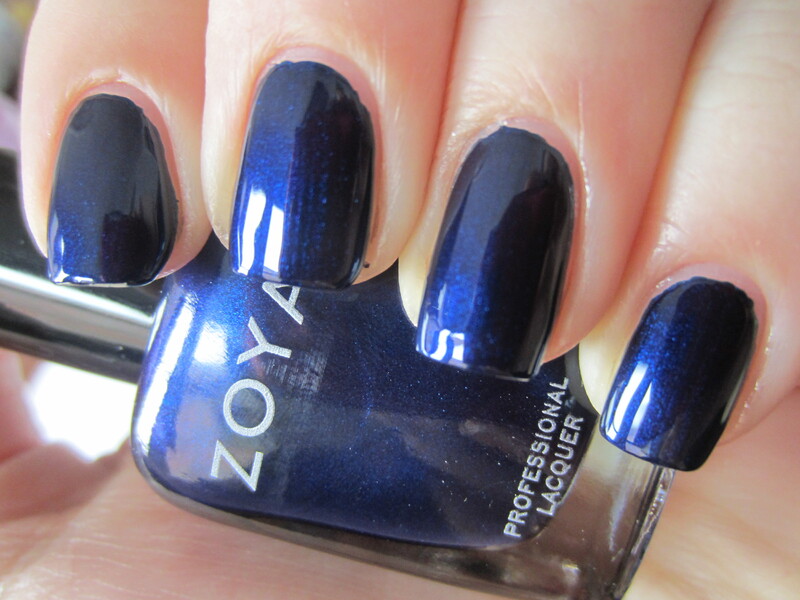 Is this similar to OPI’s Russian Navy? I don’t think your posts are too wordy. It’s the perfect length. You go in depth about the polishes, but not so much that it is laborious to read. You go through the important points of a polish (coats, formula, general color, your opinion etc) which I really appreciate. hey thanks for your feedback! i really appreciate it. and it is really similar to russian navy, but its a little lighter. ibiza looks blue in almost every light but russian navy can look black indoors sometimes. other than that they’re really really similar! aww thanks sabrina! i am working on a new banner because i really hate mine! i made it on a free banner site over a year ago and cropped out their logo lol i finally got photo editing software so i can watermark my photos and i’m creating a banner there. and this is a great blue! but i bet you can find something really similar from anny! thanks for all your feedback and all your comments! i really appreciate that you comment on a lot of my posts! i do want to put bigger pictures in and thats another thing that hopefully will change sometime soon!